David Ayer writes (and directs movies about) cops. Usually L.A. cops. Most often they’re corrupt. His perp sheet includes Training Day and Street Kings (as director) and the stunning L.A. Riots-set Dark Blue (as writer). He spent his teenage years in South Central (yo!) and he writes the streets well. His dialogue is terrific and feels genuine. And his casting – particularly of the minor characters – is sublime. Like The Wire, it feels like Ayer has gone into the real mean ‘hoods and found the real gangstas to play the villains in his films. 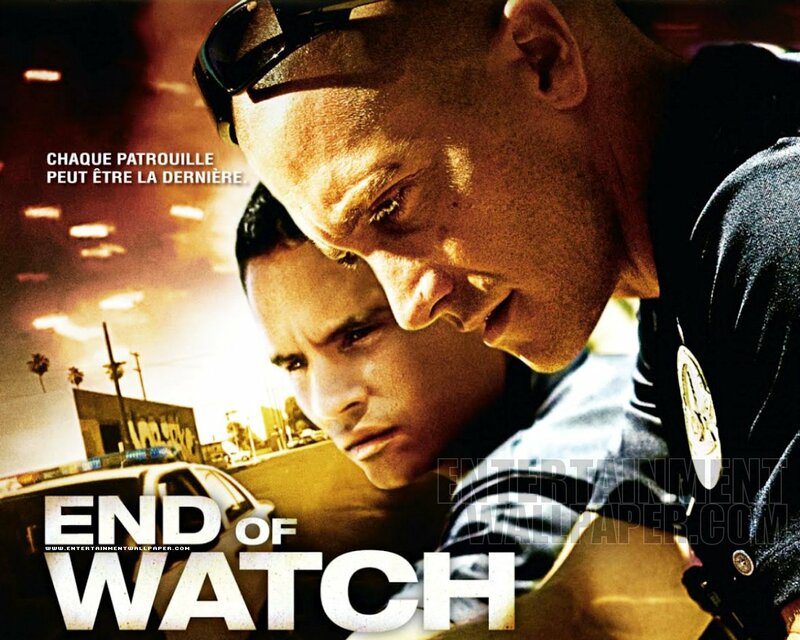 End of Watch is his most gritty, realistic, “street” film yet. But it veers markedly away from his previous work by focusing on a couple of ethical, clean cops who are actually out to make a difference, not a buck. Brian and Mike (Gyllenhaal and Peña) are cop-car partners who truly like each other, their work, Los Angeles, and the life that binds them so closely together. Young, idealistic, and dedicated, the movie opens strongly with them essentially being “blooded”: they have to take down a couple of thugs in a shootout, guns blazing, and the shooting – investigated, as all L.A. police shootings are, as a homicide – is ruled fair. They’ve tasted the invigorating side of police work, the side that isn’t issuing tickets; they’ve experienced the action, and they want more. The way their story is told to us is as found footage, and it’s the only element of the film that doesn’t work fluidly. If you don’t like “shaky-cam”, this will present a problem; it’s one of the shakiest pictures in years. The justification for the conceit is also pretty shaky. Brian is enrolled in college, and he’s supposedly shooting his day to day routine with his partner for a project in his filmmaking class. There’s nothing wrong with this – it’s Los Angeles, everyone’s a filmmaker, even cops! – but the concept jumps the shark the moment we go into the car of some of the bad guys – somewhere Brian simply isn’t. A lot more justification occurs of the “Man, put your phone away!” variety, and it’s simply laboured – and unnessessary. If Ayer wanted to make a handheld movie, he has every right, as Paul Greengrass (Bloody Sunday, United 93, Bourne 2 and 3) does, to simply make one. He doesn’t need to waste time shoehorning the concept into an otherwise extremely taut script. Like his other films, the street characters are played by a remarkable panoply of real-life types who speak in a thrilling, totally believable patois that’s at times hard to follow – which doesn’t matter; we always get the drift. These are citizens of the “other” Los Angeles, the one that’s in Boyz N The Hood, not The Player. It’s not just drugs and guns that are dangerous in this world, it’s everything; the world itself is the fiend, brilliantly and devastatingly demonstrated in a scene when our boys investigate the plight of a couple of missing children. Gyllenhaal and Peña’s camaraderie is the glue that holds the whole (intentionally, and effectively) episodic thing together, and the scenes spent in their squad car with them as they riff with each other (Gyllenhaal doing “what Hispanic people talk about” being taken down by Peña’s “what white people talk about” is just brilliant) are some of the best in the movie. They’re funny, real, and engaging – we like these guys, which is a monumental shift for David Ayer characters. We support them. Heck, we might even be willing to cheer for them. Of course, a more determined plot sets in, and when it does, the tension and suspense ramps up considerably. But the story isn’t what’s so effective about End of Watch. It’s the performances, the milieu, and the details. It’s the locker room, the standard-issue equipment, the competition, the hierarchy, and the strange human dynamic. People join the police force for different reasons, and it becomes (movingly) apparent that these two guys have been very lucky in being matched up – they legitimately like and respect each other, and they’re both in the game for similar reasons, albeit with very different personal lives. It’s a very modern buddy movie, but it’s a buddy movie nonetheless. There is excellent and surprising work from David Harbour and Anna Kendrick (as non-gangstas), but, really, it’s all about Gyllenhaal, Peña, and the thugs. And, of course, the mean streets themselves. The film was shot – depending on who’s telling you – for around fourteen million dollars, and despite its wide release and heavy marketing, it’s got an independent, auteur feel, like something that slipped through the system on its own terms. It’s also tremendously fun – as long as you can find the fun, as the lead characters do, in this grim, violent, and often depressing world.